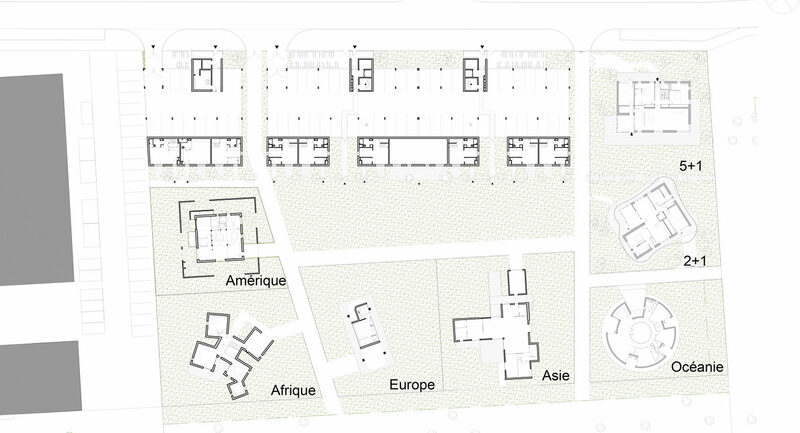 53 social housing units, 5 houses of 5 continents et 2connetced houses. A small village to the south of Reims having undergone rapid growth since the opening of the Champagne- Ardennes TGV station, Bezannes wants to be a testing ground for the innovative housing built by the PLURIAL NOVILIA social landlord. The 172 hectares, home to housing and a range of professional activities (Cristal Union, the future Courlancy polyclinic and world-class companies) embody the territorial dynamic being developed. There will be three separate and innovative programmes (covering one hectare) that defy the established codes. PLURIAL NOVILIA plans to be their representative in their relations with the social landlords. The decision to make use of local industrial partners is a way of illustrating the levels of excellence to be found in the Champagne region. Konekti: two connected houses designed by the architect Bruno Rollet will act as a regional demonstrator for the six months prior to their occupation by inhabitants in 2018. They will use all the knowledge, skills and leading edge construction technologies to be found in the Champagne Ardennes region. Bezannes Esperanto: fi ve radically different houses. Imagined by a firm of architects from five different continents(AREP, LACOSTE, OUALALOU,S’PACE and TRYPTIQUE), they are being financed as intermediate rental housing (LLI). In partnership with Bruno Rollet, the AREP Ville engineering fi rm provides a mission ensuring the coordination and definition of the layout plan. A traditional collective block containing 53 housing units designed by the architect Bruno Rollet. Handover: early 2018.